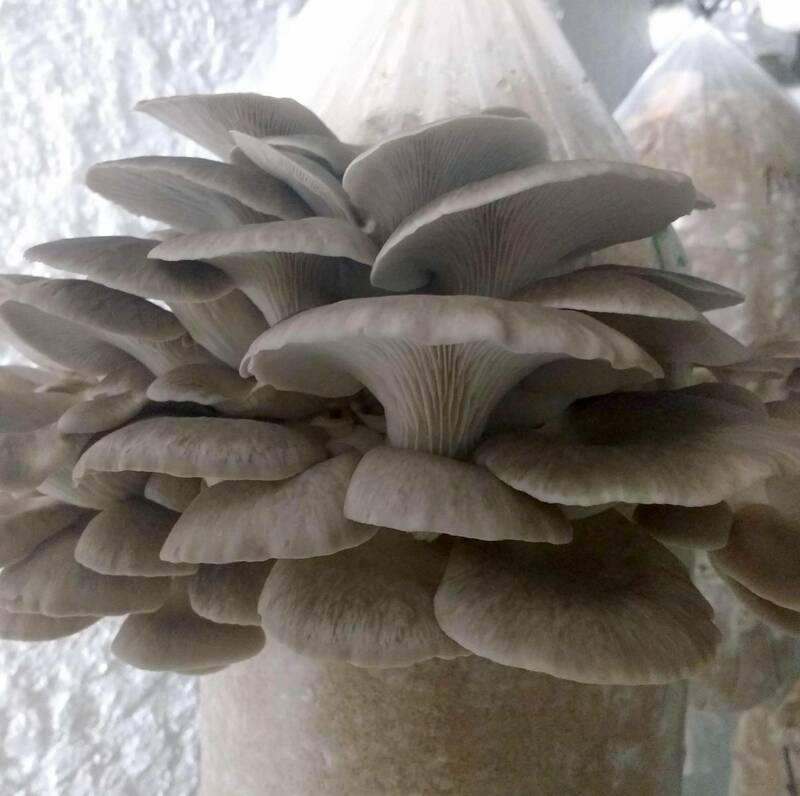 The Phoenix Oyster mushrooms grow in clusters of 5 or 6 mushrooms (more like 20+ with our awesome production process! ), and we grow these year-round indoors. The flesh is smooth, thick and white, the texture is silken and tender, and its taste is mild and faintly sweet. Phoenix Oyster mushrooms scientific name is Pleurotus pulmonarius, and they grow in forests on dead wood, often quickly decomposing the wood they are growing on. They tend to prefer conifer trees, and do well growing on firs, spruce, poplar, oak, maple, elm and aspen trees, but can also be cultivated from spores in mediums like straw, hay, sawdust and coffee grounds. At Lindale Gourmet Mushrooms we grow on imported oak hardwood and feed them soy hull pellets as nutrition. Oyster mushrooms contain high amounts of amino acids such as thiamin, riboflavin, folic acid, sterols, and carotenoids. They contain high levels of vitamin C, potassium and iron. Oyster mushrooms are primarily made up of protein and complex carbohydrates and are one of the best sources of ergothioneine, a unique antioxidant found only in fungi. Ergothioneine has been shown to help fight chronic inflammation and may prevent the build-up of plaque in the arteries, which leads to cardiovascular disease. Oyster mushrooms help to boost the immune system and may have medicinal uses for reducing pain sensitivity. Phoenix tail oyster mushrooms pair well with fish, chicken, lamb and pork, and may be used in soups, pasta, risotto, casseroles, stir-frys, tarts/pies, terrines, slow cooks and more. Or simply sauté them in garlic and butter and enjoy them on their own with some quality bread. This variety only needs 5-8 minutes cooking time. These mushrooms will keep for up to a week if stored in a paper bag in the refrigerator. Even if they dry out a little, they will bounce back when cooked! We use our harvested grow bags as mushroom compost for our vegetable patch.